The upkeep and maintenance involved with home ownership can be daunting, but the results from failing to do so can be dangerous and costly. Rain gutters are the water management system for your home. They are necessary in order to protect your home from its worst enemy… water. Not having gutters, or worse – having clogged gutters that direct water where it does not belong can result in costly repairs. As uncontrolled rain water pours directly from the roof to the ground it causes erosion, weakens the foundation, and can lead to cracks in drywall, wet basements and wet crawl spaces. Clogged gutters can also lead to siding damage, wood rot, pest and critter infestation, paint damage, roof damage, fire hazards, and icy walkways in the winter. The regular chore of climbing a ladder and scooping out the muck in gutters is a mandatory task in home maintenance. With gutter protection, your gutters stay clear of debris, leaves, pine needles, and with our solution even the build-up of roofing composite material. In short, your gutters remain muck free. This means that rain flows through your water management system, which keeps your home protected. Additionally, cleaning the Standard Gutter Guard system is as simple as blowing it off with a leaf blower or brush. Standard Gutter Guard is a fourth generation product designed and manufactured in Washington State. Through years of development, testing, and proving, this design has become one of the most easily installed, functional, and affordable stainless steel gutter guards on the market today. 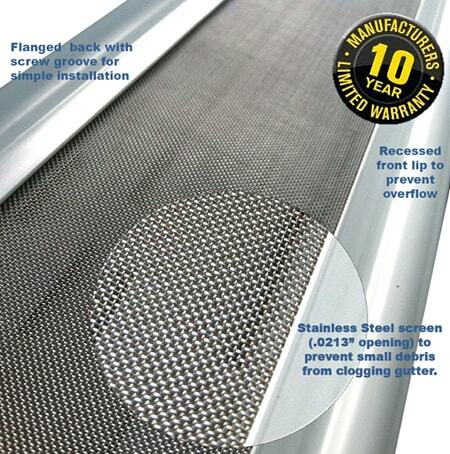 Standard Gutter Guard is a stainless steel mesh combined with a coated aluminum substrate. The coated aluminum is louvered for maximum water flow, then formed around the stainless steel. The stainless steel screen is specifically chosen because the holes are small enough to keep out roof granules, pine needles, and any larger debris from entering the gutters. However, the holes are large enough to allow pollen and bio-organic material to pass through and flush out the gutter system. Simple to Install. Reliable in functionality. The base of Standard Gutter Guard is comprised of .019” aluminum supplied from Alsco Metals Corporation and is made of 92.08% recycled aluminum. 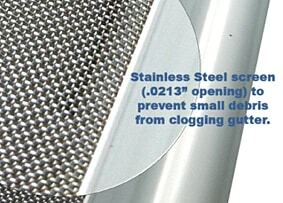 The stainless steel screen is purchased from McNichols Company in Washington State. The steel mesh is comprised of a 304 alloy, square weave, 30 mesh, .012” wire, and with .0213” openings. Essentially, this screen was specifically chosen because the holes are small enough to keep out roof granules, pine needles, and any larger debris from entering the gutters. However, the holes are large enough to allow pollen and bio-organic material to pass through and flush out the gutter system. A key feature is the flexible, yet highly durable aluminum body that installs less than a ¼” recessed below the lip of the gutter. This almost invisible, non intrusive design allows it to function in even the hardest of rain storms.